We have all levels of pony available for hire for this coming seasons camps. Please see the Pony Hire/Pony Club page for costs. Just back from Argentina, we are pleased to report a great time had by all. Our group of 9 all had fun in the sun and everyone improved their game. Roll on next year! We also spent some time visiting other facilities and estancias, which would cater for clients who maybe want to pamper themselves a bit more. We visited the Hurlingham Club in Buenos Aires as well as various places in Pilar. Anyone wanting more details should contact the club, thom@thombell.co.uk or 07831 365194. We are please to be running our 4th trip to Argentina in January 2011. After the success of previous years, we are happy to be travelling out again on 21st January to our friends at La Mariposa Polo Farm. These trips have proved to be beneficial to all levels of player, from beginners to those with more experience. If you are interested in joining us this time around please email gillian@glockhart.wanadoo.co.uk or thom@thombell.co.uk for more details. Due to popular demand we are running another trip to La Mariposa, in Argentina this winter. Last years trip was a great success with all the students improving their standard of play, whilst having great fun at the same time. As a result, we are looking at having a fully booked trip this year, so it will be first come first served if you want to join us. We will be going on Friday 22 January for up to 2 weeks. It is recommended you go for at least 10 days to get the most benefit, but it is entirely up to you. A week, 2 weeks or longer, is fine. If you want to book a place or get details please contact myself, gillian@glockhart.wanadoo.co.uk or thom@thombell.co.uk, or call thom on 07831 365194. **Deposit required to hold a place. Unfortunately round 3 postponed until next Wednesday, 11 March 2009. Results will be posted after. The round robin started with Stirling V St Andrews, with St Andrews winning well, scoring 6 goals to Stirling's 0! St Andrews stayed on to take victory again over Aberdeen, scoring another 6 goals, although Aberdeen managed to get 1 back. The play was not all one sided as the scores reflect. In both games, St Andrews gave away many penalties because of too much fouling. The last game was Stirling V Aberdeen and a tough match, as both teams badly wanted victory to gain 2nd place in the league. The score was still 0 - 0, up until the last minute, when Miranda from Stirling scored the winning goal for her team. Good fun was had by all and play was much better than the first round, proving that the league is a great idea to bring people on with their play. Who knows what will happen in the next round, as I am sure Aberdeen and Stirling will be out to beat St Andrews! It is the end of exams for the students, so we decided to run a mini tournament on the beach for some of the students. Despite the bitter cold day, 12 students came along to compete against each other in 4 teams. A couple of the teams are heading off to the National Championships next month, so this was good to practice playing together. We started with team 2 v 3, with a convincing win for team 3. In the second round team 1 had a tougher time but came away victors over team 4. Both teams 3 and 1 were up for the final, determined to take the trophy. Millie, Alex and Rob fought hard, but unfortunately the experience of Flo was too much and she led her team to victory. Good fun was had by all and we enjoyed a bbq and a few drinks after before the snow and rain started!!! Thom Bell presenting trophy to winning team! We now have 7 people booked and ready to go on our trip to La Mariposa, in Argentina. 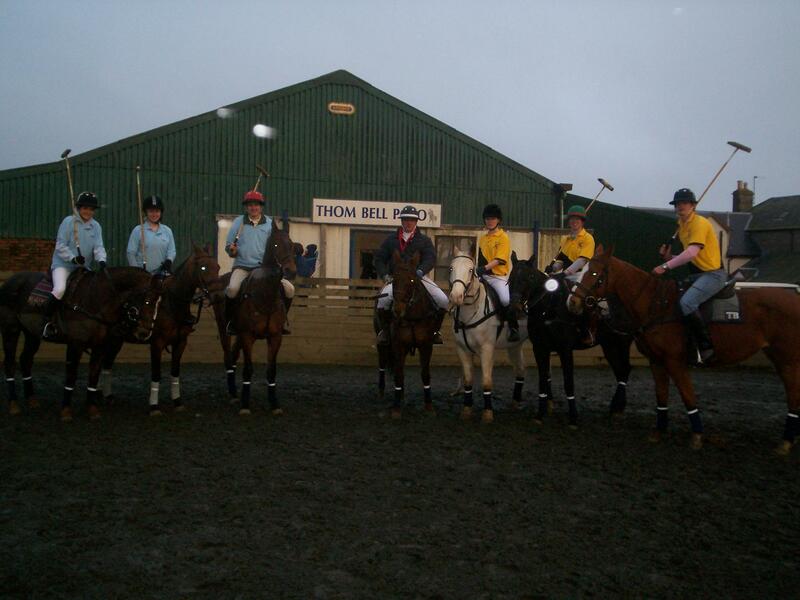 We all leave on 23 January 09, for 10 days of polo instruction and chukkas, in temperatures of around 25 degrees! Looking forward to the weather nevermind the polo. Look out for our full report when we get back. Our new University league has started off well, with teams from St Andrews, Stirling and Aberdeen competing. After the 1st round, we have St Andrews leading the race, but competition is mounting from the others, who are desparate to win. The next few months are going to be very competitive. We are holding a student/school camp on Saturday 11 and Sunday 12 October 2008. This will be a full 2 days of instruction, chukkas, good fun and a couple of drinks!! Book your space as soon as possible, to avoid disappointment. We are arranging a trip to Argentina to La Mariposa Polo. This will be going around the 24th January 2009, for about 10 days. This is a great opportunity to improve your polo, being taught every morning and playing 4 chukkas every evening. There will be limited spaces for this, so book you space quickly. Contact the club for costings etc.